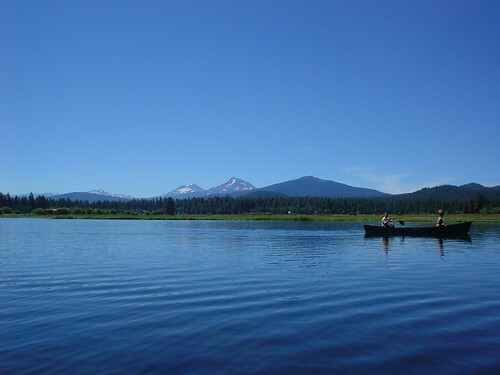 Can we get serious for a second and talk about how redonkulously gorgeous it was in Central Oregon? At one point, Erica had me pull the car over so she could process the natural wonder and beauty we'd already seen before we went on to any more. Anyway, also gorgeous was Andrea Swanson in her wedding dress. We were in Oregon to attend Andrea's marriage to Michael Strening, Jr. at the Black Butte Ranch. It was one of the funnest weddings I've ever been to, and it was really convienent how close everything was on the ranch (which is more golf-resort than ranch). The day of the wedding, we helped set up some stuff and then went and canoed for half-an-hour and still had time to change into our wedding clothes with no rush at all. I also did my 12 mile run on the ranch. In contrast to my usual half-way-out-and-back method, I sat down the night before with a map of the resort and figured out that a circuit of the bike path around the whole ranch would be just about 12 miles, so I did that. It turned out to be 11, so I had to overshoot our room and then come back. But in all it was pretty cool to get to see the scope of the whole place. I ran past horses and deer, through a meadow, around lakes, and up some easy hills. Next weekend, the half-marathon!